Looking back over a past year, we try to think of positive things that have happened and what comes to my mind is the increase in awareness of how we keep our pets in captivity and, in contrast, how we care for our birds in the wild. For years there have been intense conservation efforts being made and it is heartening to see the number of successes now materialising. I always remember the plight of the Spix’s Macaw and how there was only one known individual in the wild in Brazil, but despite much effort years back, that particular bird disappeared, making Spix’s extinct in the wild. However, due to the undying efforts of conservation projects, the number of Spix’s Macaws that now exist, although in captivity, has risen, and when numbers reach around 150, there will be serious action to release them in to their natural habitat in Brazil. One of the biggest achievements this year, and fairly recently, was with CITES issuing a ban to stop commercial trading of African Greys. However, these birds still need protection and the World Parrot Trust has been campaigning to raise money with their “Be His Hero” project - click here. Some other successes: Field conservationist, Dr Sam Williams, has spent many years in Central America with the Echo Project and through his determination and hard work, has brought the plight of Central American Amazons to the fore. In Bolivia, there is great work by Asociación Armonía to increase the populations of the Blue-throated Macaws, supported by Loro Parque Fundación. In the Far East, efforts by the Indonesian Parrot Project (IPP), which is fighting the cause for many of the White Cockatoos. I have just mentioned a few here, but we must not forget the many other organisations around the world that are fighting to keep our wildlife intact. All in all I think the efforts of all these organisations is quite outstanding and to see the populations of these birds increasing in the wild is heartening. Last month we reported that parrot thefts are currently well down compared with previous years and this trend continues. During the last four weeks we have been notified of only two actual break-ins when birds were stolen and those thefts albeit planned crimes are not connected and appear to be ‘one-off’ incidents. The first theft took place overnight in the Guildford area of Surrey when the thieves broke into external aviaries and stole three parrots. 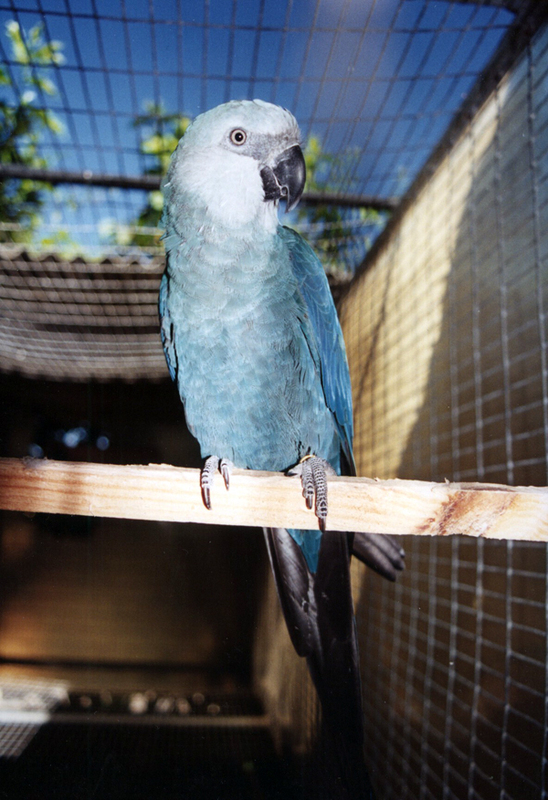 Those taken comprised of two African Greys and a Lesser-sulphur Crested Cockatoo. There is no doubt that they will have been offered for sale and we appeal for anyone with information to come forward and help track them down. 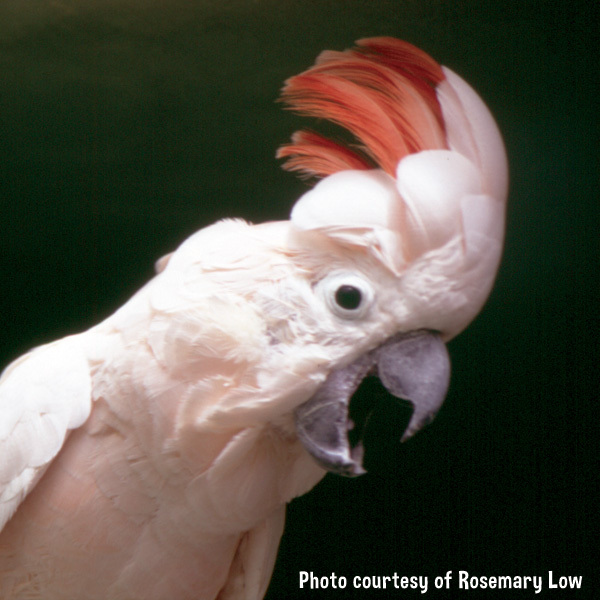 One important aspect is that the Cockatoo is now listed on Annex A – Appendix 1 and such species can only be sold legally with an Article 10 licence issued by the Department for the Environment, namely the UK management for CITES. It is not always an easy matter for bird-keepers to keep abreast with the relevant legislation, especially the pet owners who rarely enter into trade. The Lesser-sulphur Crested Cockatoo in fact was only upgraded to Annex A in 2004 following the CITES Conference of Parties held in Bangkok that year. 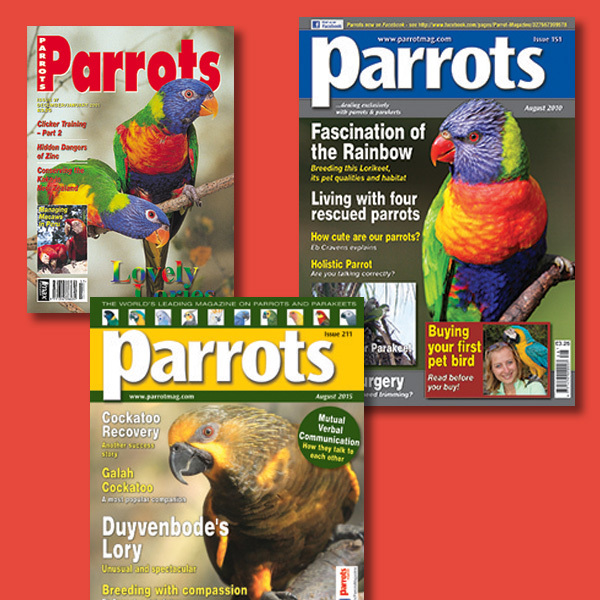 We would advise all parrot enthusiasts to keep an eye on the CITES listings so readily available on the Parrotmag.com website. It must be emphasised that to buy or sell such a bird without the licence is a serious criminal offence. The other incident, again at night relates to the theft of a collection of Budgerigars from an aviary at a private house in Gravesend, Kent. This is a particularly sad event as the lady owner who bred the stock loved to watch and listen to the birds whilst in her garden and she is devastated with her loss. Some information has come to light locally that the thieves placed the Budgerigars in their own aviary and many subsequently escaped. We await ay reports of stray birds being sighted in the area and the Police have been notified. Dealing now with the lost and found parrots for the month, again the main escape artists are the African Greys. In fact we received reports of twenty lost in this period with a further eleven being found. It is pleasing that a number have been re-united with their owners but so many have no ring or microchip in order to track down the keepers. It can be seen on the website, that we can cater for any bird internationally and one Grey was registered lost in California and has safely been returned home. Other lost unclaimed parrots include Parakeets in Horley, Surrey, Bucks Hill, Essex, Plymouth and Torquay, Devon. A Senegal was found in Leicester, an Alexandrine in Birmingham, a Parrotlet in Blackpool, an Eclectus at Sevenoaks, Kent, and an Amazon at Stoke On Trent. 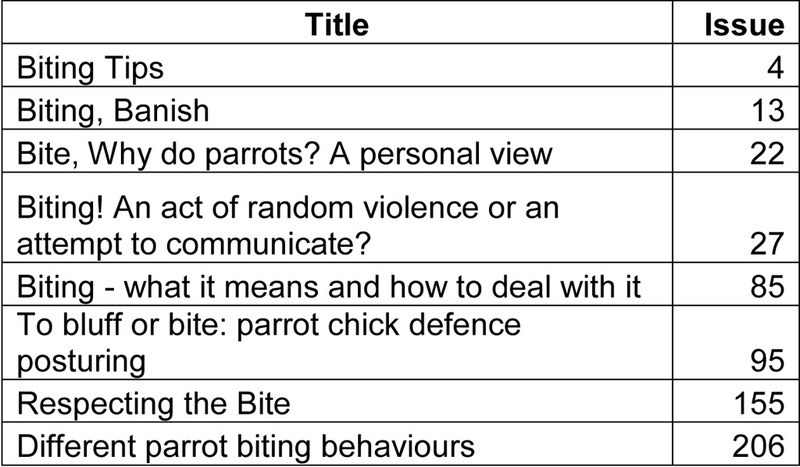 If you’re having issues with your parrot screaming, here are a few articles specifically about this subject that you might like to check out from back issues. All prices include p&p/shipping. Available while stocks last. Ordering back issues is easy, either on our website by clicking here, or call us on 01273 464777. 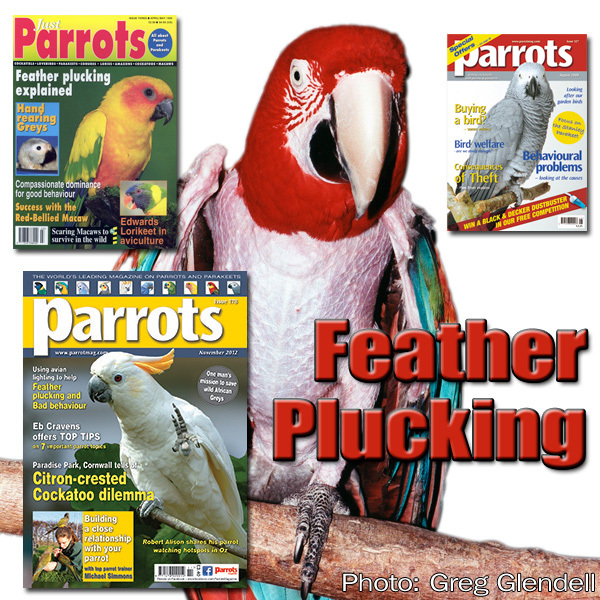 If you’re having issues with your parrot feather plucking, here are a few articles specifically about this that you might like to check out from back issues. 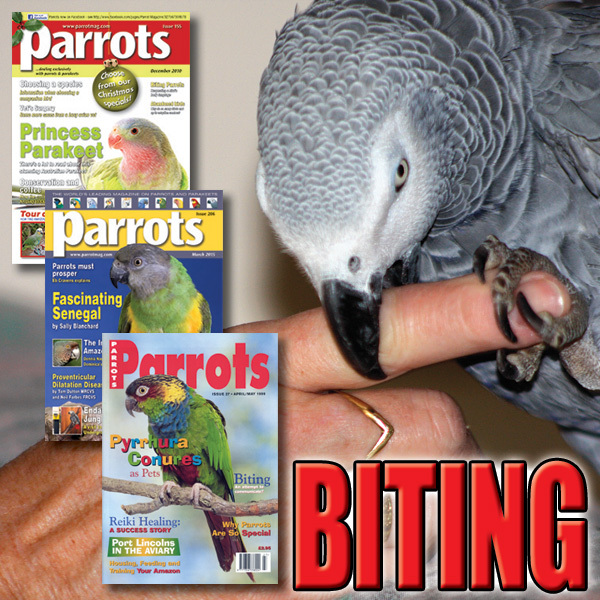 If you’re having issues with your parrot biting, here are a few articles specifically about biting that you might like to check out from back issues. 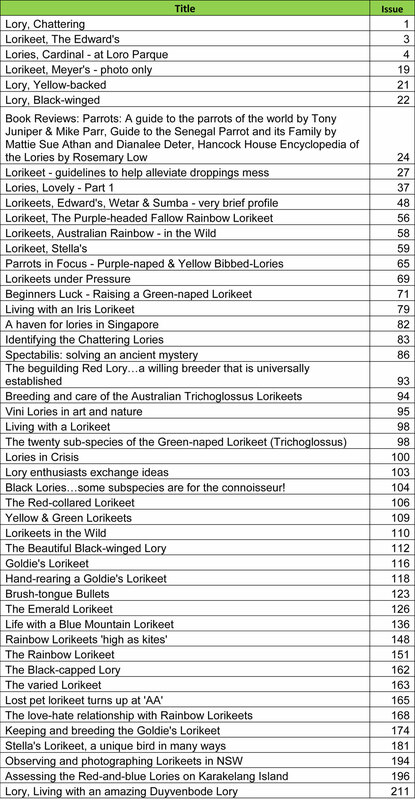 Continuing with our series on back issues by bird type, here are the articles about Lories & Lorikeets. Please note that some articles are Readers’ Stories. However, take advantage of these special Christmas rates valid until 31st December 2015! 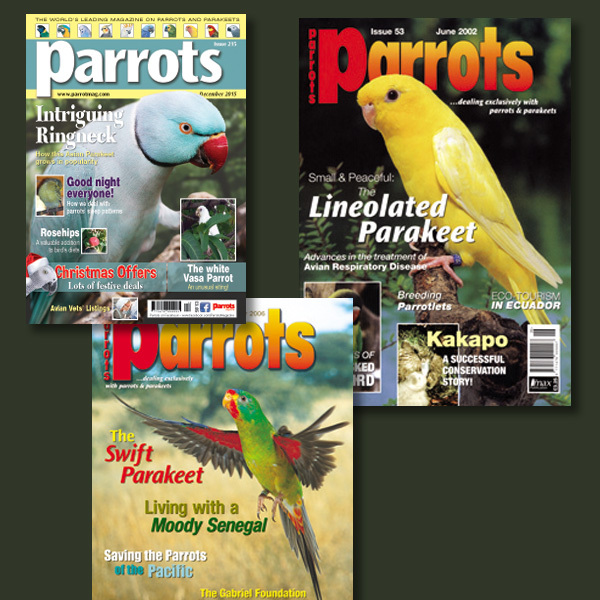 Continuing with our series on back issues by bird type, here are the articles about Parakeets. Please note that some articles are Readers’ Stories. 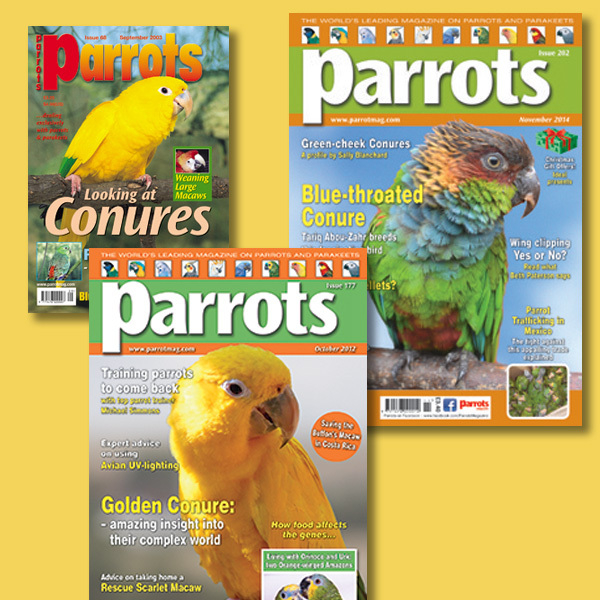 Continuing with our series on back issues by bird type, here are the articles about Conures. Please note that some articles are Readers’ Stories.